Designed for the active senior aged 55 or over, Greenbriar at Fox Ridge has a multitude of attractions and amenities for every need, personality and interest. 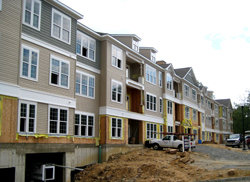 Greenbriar is located in Rockaway Township, NJ, where residents can enjoy the picturesque view of rolling hills, and walk or bike along trails in the wooded countryside. The area also offers plenty of cultural venues and historic getaways, as well as golf courses, lakes, and other public spaces. In addition to its scenic location, Greenbriar at Fox Ridge is conveniently situated minutes from Rockaway Townsquare Mall, as well as other shopping and dining options. The Greenbriar community has easy access to the area’s nearby highways and hospitals, the excitement of Manhattan, and the amenities and attractions of nearby villages. Greenbriar condominiums are designed with one-car garages, master suites with walk-in closets, private balconies and studies, breakfast nooks, and large laundry rooms. The neighborhood’s gated entry, Belgian block curbing and lighted streets give Greenbriar a safe and cozy community atmosphere. Its enormous clubhouse, which consists of a pool, sauna, Jacuzzi, and a variety of social rooms, is the site for many community activities, including many special-interest groups and social clubs. Among its long list of amenities, Greenbriar also offers tennis and bocce courts, as well as a greenhouse. The neighborhood offers residents limitless opportunities to stay active and connect with neighbors; but it also offers chances for outside noise and excitement to travel into individual living quarters. In order to ensure that the peaceful environment within Greenbriar condos is maintained, Lennar Homes utilized Keene Building Products’ RC Assurance™ clip in its ceiling assemblies. 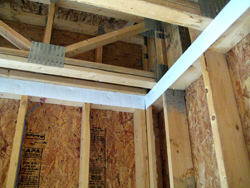 The clip acts as an impenetrable washer that adds extra space between the resilient channel and ceiling joist, preventing noise from traveling between floors. RC Assurance™ works at a performance level equal to expensive hat channel systems, but provides an inexpensive alternative. Whereas many soundproofing systems are mostly designed to filter higher frequencies to meet building codes, RC Assurance™ achieves excellent performance at the lowest-level frequencies (below 400 Hz) as well. It also offers the added safety of a hard steel plate in the resilient channel system. Just as RC Assurance™ was utilized to ensure the proper detailing in the ceiling assemblies at Greenbriar, Lennar also chose to include Keene Building Products’ Space Assurance ™ to ensure proper detailing around the ceiling perimeter. Space Assurance ™ is a flexible, flame-resistant polyester fabric that is used as a fastener line around the ceiling perimeter. This simple step eliminates a common path for flanking noise and provides the proper space detailing between the wall and ceiling. At a senior living community like Greenbriar, these steps are essential to isolating footfall and other noise from traveling between rooms. At Greenbriar at Fox Ridge, the private study is one of the most unique attributes of the condominium units. Keene’s RC Assurance™ clips and Space Assurance™ ensure that this room really does live up to its “private” nature. They are also fundamental to maintaining Greenbriar’s reputation as an upscale location with a quiet, small town atmosphere.